Easter Sunday will remain etched in their memories for quite some time. James Mead and wife Debbie Pillman with their children in tow were returning from an Easter Sunrise Service in Las Vegas when they noticed something amiss. Heading westbound along the Highway 372, both spotted an elderly woman passed out along a sidewalk just after 10 a.m.
Pillman said it was then they witnessed the true bond of a dog with its owner. “My husband looked and said ‘there’s someone on the side of the road there.’ We pulled into the middle lane and made a U-turn and at that time, the dog was watching us. He came out to the middle of the street and there was a lot of traffic. A couple of the drivers halfway stopped and others were just blowing their horns,” she said. As her husband exited the vehicle the dog, identified as “Shadow,” a black lab, left his owner’s side, walked onto the highway and promptly sat down in the middle of the road as oncoming traffic continued to whiz by the scene. “The cars just continued to go around him without realizing there was an elderly lady lying on the sidewalk.” Pillman said. “When my husband picked up his leash, the dog immediately ran directly back to the lady lying on the ground pulling my husband with him,” she said. Pillman said she then parked and engaged the vehicle’s emergency flashers before exiting the car to find out exactly what the problem was. “I left our children in the car for their safety and went to check on the woman. She said she had fallen and the dog immediately laid directly next to her side. We were just amazed about the bond between the lady and the dog. People were beeping and yelling at us to get out of the road. One gentleman stopped and asked if we were okay though,” she said. Minutes later, Pillman was on the phone to summon help from Pahrump Valley Fire and Rescue Services while the dog continued to try and comfort his owner by just lying next to her. Pillman stood guard over the two while her husband walked to a nearby convenience store to purchase a few bottles of water. “While we were waiting for help to arrive, my husband gave the lady and her dog some water. The deputies showed up and realized that she really needed to be taken to the hospital. At that point, we were not sure what to do with the dog because the lady begged us not to let the pound take him,” she said. As pet owners themselves, Pillman and Mead offered to care for Shadow while the owner recuperated. The only problem was the family had doctor appointments for their kids the following day in Las Vegas. Pillman is a stay at home mom while her husband works at Mountain Falls. “We wanted to keep Shadow with us but we have four rescue dogs at home, plus I had to take the babies into Las Vegas,” she said. Pillman said Nye County Sheriff’s Office Detective David Boruchowitz responded to the scene and offered a suggestion for Shadow’s care. She also noted Shadow’s reaction while EMT’s were preparing the woman for transport to Desert View Hospital a few miles away. The dog was literally shadowing his master. “Mr. Boruchowitz suggested that it would be best if he was put in police protective custody to keep him safe. I didn’t want him to run off trying to look for her. He seemed grateful for the water. When they were putting her into the ambulance, this dog literally cried, barked and pawed at the ground. We tried to comfort him and I have never seen a dog understand better than this dog,” she said. 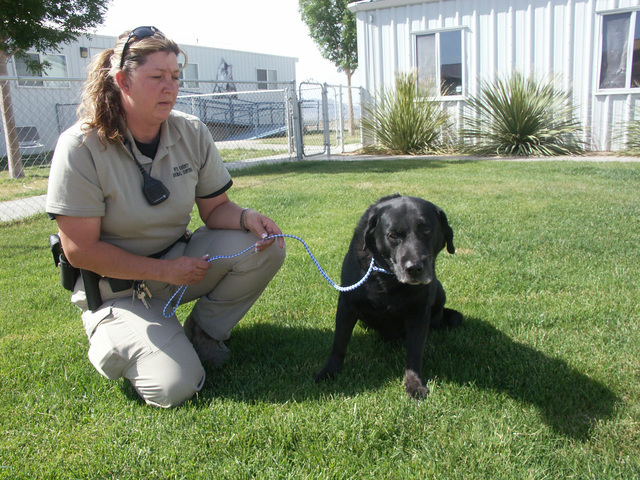 Shadow was eventually taken to the Nye County Animal Shelter courtesy of Animal Control Officer Susan Rhyhol. On Monday, Rhyhol said Shadow seemed to be in good condition in the absence of his owner. She also said during her time as an animal control officer, she has never seen a situation as the one that transpired between dog and owner on the morning of Easter Sunday. “These stories happen all over the world. The bond between animal and human can be very, very, very strong. Historically, domestic dogs particularly have done heroic things for their owners time and time again. It’s not unusual. I was standing there with tears in my eyes. It really was a touching situation. This dog tried and tried to get someone to stop and get help for his owner by sitting down in the middle of a busy highway. He knew exactly what he was doing,” the animal control officer said. Rhyhol confirmed Pillman’s statement about Shadow not wanting to be separated from his owner when paramedics were getting ready to transport the woman. “As the medics were loading her into the ambulance, all that dog did was focus on her. He didn’t pay attention to anyone there except for her. Nobody else there was of interest to him,” she said. Boruchowitz, too, said he was astonished by Shadow’s heroic actions that morning. “It was pretty incredible that the dog actually stopped traffic and directed the driver of that car over to the lady,” he said on Monday. Normally what’s known as “Service Animals” are specially trained to do work and even perform tasks for the elderly and people with disabilities. Pillman, meanwhile, said she believes Shadow was merely acting on pure instinct. “He acted as if he was and I’ll tell you that I have a history working with the blind and guide dogs. This dog acted as if he was a service dog, but from what I gathered, the dog had no training other than being attached to her,” she said. It is unknown how long the woman was lying along the side of the road that morning but all parties agree that if it were not for the efforts of Shadow, the owner would have faced greater peril. When asked why the family stopped and offered help, Pillman’s husband replied with a question of his own. “It’s just the right thing to do. I’m not looking for any publicity, but when you see somebody laying on the side of the road, there’s obviously something wrong. It’s the human thing to do,” he simply said. Pillman did learn that the woman had suffered from a bout of heat stroke while walking along the highway. She said on Tuesday the woman is recovering nicely. “She had the Book of Mormon with her and she had tried to make it to Sunrise Services. I was on Facebook trying to see if anyone knew her,” she said. At last check, Shadow seemed to be doing just fine in his very own private temporary home at the Nye County Animal Shelter surrounded by dozens of new friends. An employee who spoke to Shadow’s owner this week said the woman is expected to make a full recovery and will be reunited with Shadow very soon.